January 27th is British author Lewis Carroll’s birthday. Born in 1832, Carroll is best known for writing “Alice’s Adventures in Wonderland”, and its sequel, “Through the Looking Glass”. His well-regarded writing style is certainly unique, employing clever word play and fantastical descriptions. What most draws me to him, though, is his usage of nonsense language. Carroll had the remarkable ability to make up a word seemingly out of thin air, and yet have that word’s meaning be almost instinctively known by the reader. His great talent for language shows that the meaning we ascribe to a word depends much on the sound of that word and the context in which that word appears. Even more remarkably, some of the meaningless words that Carroll created would actually become real words. The best example is “chortle”, which is a combination of “chuckle” and “snort”. I have chortled from time to time, and I’m sure most of you have as well. Carroll realized that chortling was a common, though undefined, human activity, and all he had to do was put a name on it. It’s one of my favorite poems to recite, even if (perhaps because) half the words are nonsense. In seven short stanzas, the poem tells a complete story. 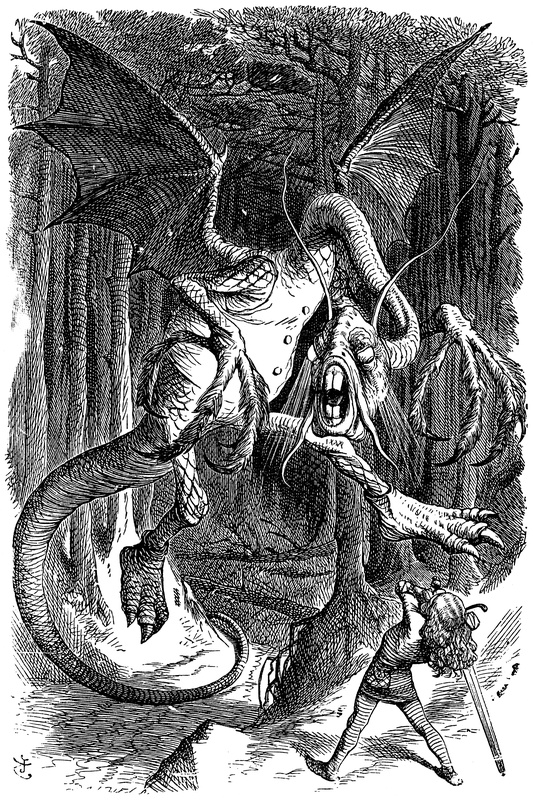 First we are introduced to the Jabberwock, a dangerous monster with jaws and claws. The beast is quickly slain by our nameless hero with a “vorpal blade”. Finally, there is celebration (“Callooh! Callay!”). The poem’s whimsical, lyrical cadence really make the story sing. Sure it is the story of a man slicing off the head of a mythical monster, but it is also so much more. Using onomatopoeia, colorful words, and old English phrases, Carroll really paints a picture of another, much more fantastical world. From the very first lines, one is transported to a world of strange creatures (such as “toves”) doing strange things (“gyre and gimble”), and confusion only spurs the reader to delve deeper into the strangeness. Let’s look at just a few of these strange words. According to the Humpty Dumpty character who comments on the poem after it is read within “Through the Looking Glass”, “brillig” means 4:00pm, the time of day when you start broiling things for dinner. A “slithy tove” I might guess to be a “slimy toad” from the sound of it. Humpty Dumpty explains that “slithy” means both lithe and slimy, and “tove” is actually something like a badger. And then there are words for which there are no definitive explanations. For example, Carroll himself claims not to know the source of “tulgey” or “vorpal”, but thoughtful fans have proposed their own definitions. The wikipedia article, which is several times longer than the poem itself, contains explanations and possible meanings for every one of Lewis’s creations. And what of the Jabberwock itself? What exactly is this monster, and where did it come from? The only description we have is that the Jabberwock has claws that catch, jaws that bite, and eyes of flame. John Tanniel illustrated the creature for the book, and his drawing is reproduced below. It appears much like an oversize, long-necked pterodactyl. As for the name itself, Carroll has stated that “The Anglo-Saxon word ‘wocer’ or ‘wocor’ signifies ‘offspring’ or ‘fruit’. Taking ‘jabber’ in its ordinary acceptation of ‘excited and voluble discussion’, this would give the meaning of ‘the result of much excited and voluble discussion’…” Therefore, a more modern name for the Jabberwock might be something like Notorious. You can still find many references to the poem in media today. I always chortle when I see a vorpal blade show up in a videogame, such as World of Warcraft. Not all of Carroll’s created words have staying power, but it is never too late for anyone to start using them. The beauty of language is that it is always evolving, and any word which was once new and lacking meaning can someday become a part of the lexicon. Happy Birthday, Lewis Carroll, and I sure hope it’s a frabjous one! This is quite possibly the most comprehensive dissection of Lewis Carroll’s nonsense poem that I’ve ever read! This is a masterful job of discerning the semantics of a very imaginative and entertaining poem and I truly appreciate it!